Twitter is a dream tool for your business, but it will only work if you know how to engage its users. This is true for every other social media platform you are trying to dominate. There is a big chance that you are completely consumed by your business and this is the only subject you can talk about. However, despite the initial passion, after few weeks you will run out of ideas for tweets and you will sound like an old record. This must be avoided at all cost. Use the right tools to find new ideas to tweet about. You should constantly monitor new trends on Twitter. Using a new feature called ‘local trends’, you can take it to a whole new level. It’s simple – login to your account, select location and see what’s happening in your city. If you have something interesting to say about any of the trendy topics, do it straight away! You might get a lot of attention and a ton of traffic to your website. 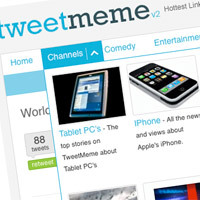 Tweetmeme.com is a fantastic website, where you can find the hottest links on Twitter. One way to use it is to select a subject that is remotely (or directly) connected with your business, investigate, and retweet the best links that might interest your target audience. You can even subscribe to an RSS feed for your selected subject and see what is new without going to the Tweetmeme site. You should not underestimate the power of Google when looking for interesting subjects related to your area of expertise. While a simple search may be too general, using the search options will filter the results perfectly. 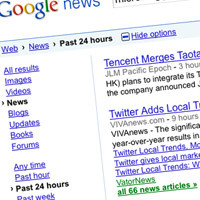 Just enter the term, select the kind of information you are looking for (news, blogs, videos etc.) and pick the timescale to narrow down your search. It is amazing how much power it gives you. If the methods described above seem boring to you, have a look at StumbleUpon.com. This is a fantastic service that not only gives you very accurate information, but it might surprise you how effective it is in digging up content you would never find otherwise.The principle is simple – you select topics of interest and StumbleUpon.com shows you websites (or images, videos, news etc.) that might interest you. You can then give a page a thumbs up or thumbs down. Every time you rate the suggested page you are making the engine more and more accurate. This can give you a neverending source of fascinating content you can share on Twitter and other social media platforms. If you don’t like to be overloaded with information, you can make a list of interesting blogs and subscribe to their RSS feeds. That way you can see all new headlines from approved sources ready to read and share. If you combine all of the above ways of finding great content within your niche, you will always have an interesting link to share on Twitter. Don’t limit yourself too much and don’t be afraid to share stuff that is not related to your business at all. It simply reminds people that there is a human behind the business, and one with a good sense of humour. Make it fun to follow you! Everytime you tweet, you are sharing interesting content. If you don’t, then you are not doing it correctly. Every interesting link you publish might get a life of it’s own and go viral. Think about each tweet like you think about the title of your blog post. Make it interesting, tempting or controversial – create a click magnet. People will start retweeting your stories if you make them interesting. Some Twitter users still use the old way of retweeting, so make your tweets a little shorter to facilitate them. Try not to include long URLs (web addresses). There are plenty of URL shorteners on the web – some of them will even give you statistics to track how many people visited the link you tweeted, like Bit.ly orSu.pr. If you are using only one social platform online, you are limiting your audience. However, if you are using many, it will consume a lot of your time to update them one by one with the same status update. There is a solution for that too … ever heard of TweetDeck? Not only is it available on all platforms (Windows, Mac, Linux) but it allows you to update Twitter, Facebook, LinkedIn and MySpace at the same time! You set up all accounts once, and each time you type in a new status message, you can select which social networks you want to send it to. Did I mention it also shortens your URLs? Of course, there are more applications dedicated to Twitter, like Seesmic Desktop, Tweetie, or HootSuite, but none of them offers as many features as TweetDeck. The multicolumn layout makes it easy to monitor all incoming information. You can reply, re-tweet and send direct messages right from the application. If you are using Facebook, it allows you to comment, like, send messages and write on walls. The same goes for LinkedIn – all communication features are available right from the application window. John: @brian I agree re Avatar, you should see new Sherlock Holmes next. Brian: Not sure @john. Some people say S.Holmes is bad. Wonder who else thinks it’s good? John: RT @brian Not sure @john. Some people say S.Holmes is bad. Wonder who else thinks it’s good? Sally: @brian @john I didn’t like the new Holmes either, but I agree – Avatar is pure genius in 3D! This applies to every subject. You can craft your tweets in such a way that people will feel compelled to answer. All that in under 140 characters! The more conversations you create and participate in, the easier it will be to generate new followers. Creating conversations is only half as effective as joining the existing ones. You should constantly monitor tweets for phrases and keywords that are related to your area of expertise. This is very easy withTweetDeck – just create a new search column and it will update itself with new tweets containing selected phrases. When you see clueless people, help them for free and they will come back for more. Once you gain their trust and give something, they will feel compelled to give back. That’s how you build great business relationships.